Paro is the most attractive of all towns in the Bhutan valley. Historically, it was also the hub of two of the most significant trading routes to Tibet. Currently, the new route to Phuntsholing on the border of India goes throughout the valley, amidst a patch work of strewn settlements, trout packed streams, wheat fields, paddies and rice. Here, Paro Chuu courses south in the chomolahri scope from its watershed. On top of it is a rock-strewn outcrop of the steep hillside, is the Paro Dzong. Overlooking both faces of the valley at an altitude of over 7,000 feet, Paro Dzong was previously one of the most strategic and strongest fortresses in Bhutan. Prior to the reconstruction of the Tashi Chho Dzong in Thimphu, it was the chair of the National Assembly as well. 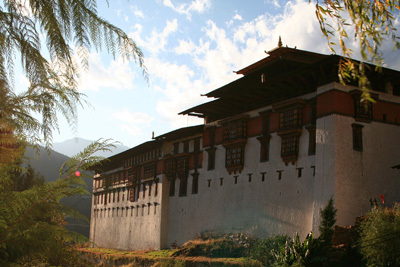 The Paro Dzong possesses a lengthy but enthralling history. There was a monastery first built on the location at the start of the 10th century by Padma Sambhaya. In the year 1646, Ngawang Namgyal constructed a larger monastery on the dated groundwork and for some centuries, this impressive five story edifice functioned as a helpful guard against several invasions by the Tibetans. Constructed with stones in the place of clay, this Dzong was named Pinpung, which means heaps of jewels. Unfortunately, Rinpung was destroyed by a tragic fire in the year 1907 along with its treasures. Only a single thangka was saved, which is called Thongdel. The Thongdel is a huge and superb illustration of Bhutanese art of trending religious scroll paintings from cotton and silk.